The Maroon Bells are often called the most scenic spot in Colorado, and photos taken there by tourists and professionals, showing two rugged, 14,000-foot-plus peaks dusted with snow and reflected in a crystal-clear lake, are among the state’s iconic images. The two peaks are Maroon Peak (14,156 feet) and North Maroon Peak (14,014 feet) from the Elk Mountains, and they are just a third of a mile apart in the Maroon Bells-Snowmass Wilderness Area. The lake in the foreground is Maroon Lake, which sits in a basin carved out by glaciers, featuring blooming wildflowers for much of the summer. The Maroon Bells get their name from the maroon color created by the rusting of tiny iron particles and the bell shape for the peaks. Maroon Lake was formed by mud and debris slides from Sievers Mountain that dammed West Maroon Creek. Two top hikes can be done with naturalist guides or on your own. The flat Maroon Lake Trail is an easy two-mile round-trip and takes hikers around the lake. Allow two hours. The Crater Lake Trail is a steep and rolling 3.6-mile round-trip through aspen groves and rock fields to Crater Lake, a smaller lake that sits at 10,076 feet, right below the Maroon Bells. The Forest Service rates the hike as moderate. Allow three hours. The U.S. Forest Service, however, warns climbers that the Maroon Bells are deadly because of loose and unstable rock and were nicknamed the “Deadly Bells” after eight climbers died in five incidents in 1965. The two mountains are composed of soft red shale and a paler siltstone that are weak and fracture easily, unlike the solid peaks of granite and limestone found elsewhere in the Rocky Mountains. Motor vehicle access to the Maroon Bells is limited to protect the environmentally sensitive lands, and visitors are encouraged to take buses from the Aspen Highlands ski area or use bicycles or other non-motorized forms of transportation. Buses run to Aspen Highlands from the Rubey Park Transit Center in downtown Aspen. The buses operate every 20 to 30 minutes from 9 a.m. to 5 p.m., starting Memorial Day weekend and continuing through Labor Day weekend. 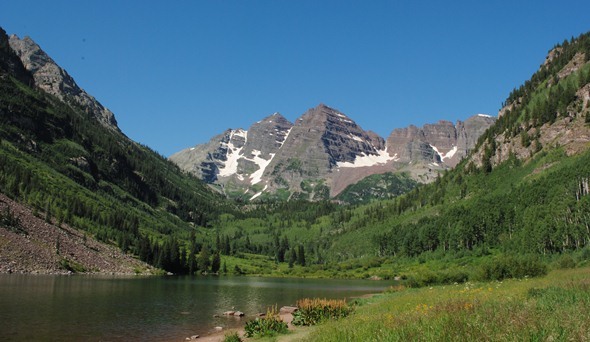 The Maroon Bells Scenic Area is operated by the White River National Forest.